In early December last year I ranted in a newsletter about “lying relationship experts”. An emotional button was pushed when I heard the Soul Mate expert who I was trained by as a Coach promoting Conscious Uncoupling and Calling In “The Next One” courses to her mostly female audience. Several people pointed out that my rant was neither Integral (seeing that everyone is right from their own perspective and what these perspectives are) nor productive, and they where right. Through reading Spiritual Bypassing by Robert Augustus Masters (excellent book) and doing some shadow work with friends, I realized that I was projecting my own frustration and the collective pain-body of men who have been unilaterally dumped by their partners (70% of divorces and breakups are initiated by women with the suicide rate of divorced fathers being ten times higher than that of divorced mothers) onto her and other relationship experts who don’t take an Integral approach to their work. First of all I realized that all relationship experts are well meaning and do the best they can. Second, all of their work provides elements and details to fill in the Integral Relationship Map (see Appendix I of Integral Relationships with 30 relationship book suggestions for different levels of consciousness) that we now benefit from. Third, books like Calling In “The One” provide value to singles at all levels of consciousness. Readers in first-tier consciousness (egocentric to pluralistic) can use such books/courses to attract partners to further heal and learn in deficiency-need based relationships. Integrally informed and second-tier singles and couples can benefit from such books to co-create sustainable growth oriented being-based partnerships if they so choose. 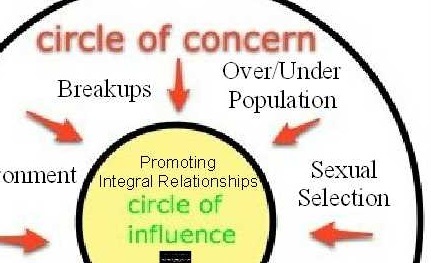 And last but not least, I will focus back on my circle of influence by promoting co-created, healthy, sustainable Integral relationships–in whatever form they may take–and no longer on my circle of concern about our sexual selection process, painful breakups and resulting socioeconomic, ecological and political challenges that we face as a humanity.